As usual, when I'm back at my parents' house over the weekend, mum would ask me to bake a cake and she likes plain butter cake. Recently I found a recipe for basic butter cake so I gave it a try. The recipe received rave reviews and it is in the Top 10 cake recipes so it is definitely worth trying. I read the reviews and lessened the sugar to a little under 1 cup because I wanted to make frosting. I also added extra milk and some orange juice to the batter. The cake baked and browned nicely. However, it cracked on top. 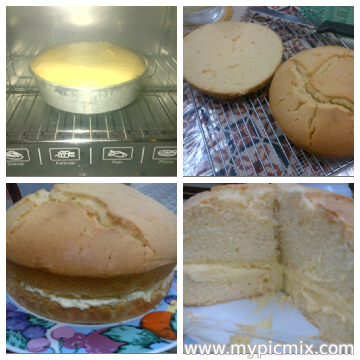 :( but I love seeing the even golden-brown colour and it's so sayang to cut the top of the cake. I know bakers do this to have an even top but I can't bring myself to waste about 1/4 of the cake. I then cut the cake into two (obviously uneven) and let it cool Earlier I made orange buttercream frosting by mixing butter, icing sugar and orange juice. Since I am not the most patient person in the world, I put the icing on the cake even before the cake was completely cooled. Obviously the icing melted and when I cut the cake, the icing oozes out which looks like the batter of an undone cake. The cake was nice but it would be nicer if it is softer and fluffier. This type of cake is simple and perfect for tea and you can use the recipe for a base of any cake. 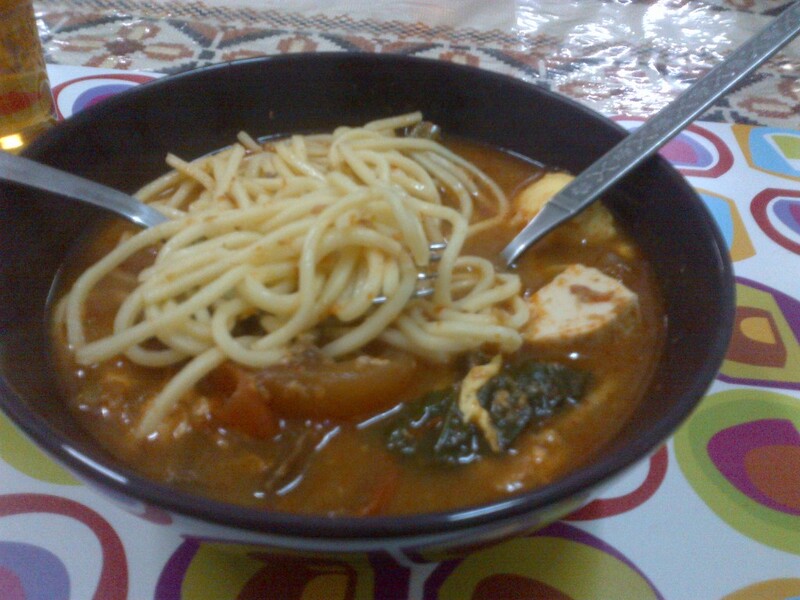 I was in Muar last Thursday and I bought a packet of Mee Bandung paste at Tanjung Emas. 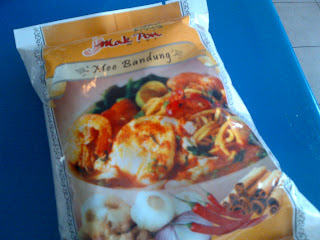 I had a plate of Mee Bandung for lunch which was good so I bought one packet. I then made the gravy on Sunday. The instructions were so easy. All I have to do is boil some beef to make a stock. We still have beef in the freezer from last raya so I cut the beef into small pieces and boiled it until it becomes tender. After that all I had to do was put in the paste and it's done. Of course you can add some veges eg sawi, tomatoes and also egg and tofu. Well, it rained that day so my gravy was a bit too runny (alasan). I should have let the beef stock reduced a bit more before adding the paste. It should be thicker. Since the gravy is a bit runny, it tasted like Mee Udang but it is good nonetheless. Mee Udang is quite spicy but if you make the paste your own, you can modify the taste according to your liking, whether you like it spicy or less spicy.